Of the many restaurant awards handed out in Chicago, only one represents the heartfelt opinions of a broad base of ordinary food enthusiasts spending their own money on the food they truly love. 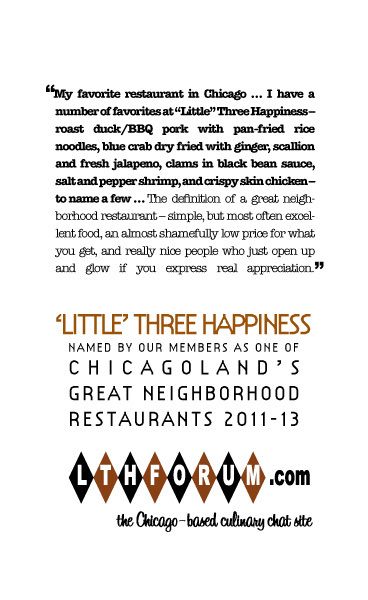 That's the LTHForum Great Neighborhood Restaurant award, nominated and awarded by the members of the popular Chicago-based culinary chat site. Its members run the gamut from four-star chefs to hot dog stand proprietors, lawyers, writers, musicians, college students and everything in between, all united by a love of food-- and a willingness to share their finds on the internet. Now LTHForum is pleased to announce that 24 restaurants originally awarded the Great Neighborhood Restaurant designation in 2005 have been recertified for the award, following a lengthy period of trial, discussion and careful evaluation-- to make sure the places chosen still have their magic that captivated LTHForum posters in the first place. Each restaurant will receive a certificate similar to the one shown above, highlighting some of what makes it special-- and in many cases, recommending specific dishes to try. Chicago is a city of great neighborhoods, made distinctive by history, ethnic mix, and vibrant street life and culture. The Great Neighborhood Restaurant awards honor restaurants all over the Chicagoland area which contribute to their neighborhoods’ and the city’s character by offering outstanding food, an authentic experience of their ethnic culture, and/or a welcoming (or in some cases, belovedly cranky) atmosphere for guests. Many of the restaurants honored in this round, such as Manny's, White Palace Grill or Freddy's Pizza, are not merely great places to eat but true cross-cultural meeting places, where power brokers and city workers, cops and perps can bump elbows or trays while enjoying honest, handmade food. Restaurants are nominated by registered members of LTHForum.com, the Chicago-based culinary chat site, and ratified by a group including the moderators of the board, based on the degree of discussion and community-wide enthusiasm evidenced on the site. For the renewal process, this meant that each restaurant must either have had ongoing favorable discussion since it won the award in 2005, or members had to try them again and report back to ensure that the restaurant had retained its previous level of quality and distinction. Click on each restaurant’s name to read the nominating thread for more details. For a handy pocket guide to all 65 currently open LTHForum Great Neighborhood Restaurants, gohere. La Oaxaqueña-- Pair of fine family Mexican restaurants on north Milwaukee and west Diversey, serving outstanding freshly-made versions of classics like chicken mole.